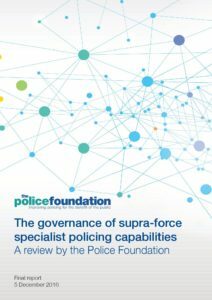 This report summarises findings from research completed by the Police Foundation on the governance of specialist policing capabilities delivered above the level of individual police forces, with a particular emphasis on collaboration. The work was completed in response to the need for the police service to identify the changes necessary to respond to new threats and deliver an improved service for the public, against a background of ongoing austerity and fundamental changes to the nature of crime and police demand. This work was commissioned by the governance working group of the Specialist Capabilities Board, governed by the National Police Chiefs Council (NPCC) and Association of Police and Crime Commissioners (APCC) Police Reform and Transformation Board. Gavin was Deputy Director of the Police Foundation from May 2014 to May 2017. Previously, Gavin was a Visiting Senior Research Fellow at the Institute for Criminal Policy Research (Birkbeck College) working on a study of misconduct by chief police officers for the College of Policing. Gavin has extensive experience as a researcher working on crime and policing issues and has previously worked as a consultant for NatCen Social Research, and for the University of Essex, the Metropolitan Police Strategic Research Unit, and the University of Portsmouth. Andy joined the Police Foundation in July 2013 having spent nine years in analytical roles with the Metropolitan Police Service. During his time with the MPS Andy worked as a crime and intelligence analyst before moving to a central Corporate Development team where he carried out strategic research, corporate performance analysis and co-authored a large-scale evaluation of an Integrated Offender Management initiative. He has also worked in commercial qualitative and quantitative market research and has an MA in Criminology and Social Policy. Dr Rick Muir is Director of the Police Foundation, the UK’s independent policing think tank. He has been a public policy researcher for most of his career, most latterly working on public service reform, including on policing and criminal justice policy, at the Institute for Public Policy Research (IPPR). Prior to that he did his DPhil in Latin American politics at the University of Oxford. He is currently a Visiting Professor at Northumbria University, a Fellow of the Royal Society of Arts, Manufactures and Commerce (RSA) and a member of the Cumberland Lodge Police Steering Committee. He was previously a local councillor in both Oxford and Hackney.